Ahead of tomorrow’s general election in Indonesia, the Bishops Conference of Indonesia is calling for clean politics against corruption and violence. Source: Vatican News. “It is important to differentiate between clean politics in the highest sense of the word and the electoral race. In Indonesia, healthy politics is overshadowed by pervasive corruption that implicates politicians, officials, civil servants and government bodies,” Archbishop Ignatius Suharyo of Jakarta said. 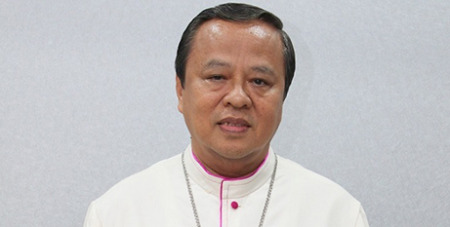 “With a lack of moral conscience, the public has lost faith in its leaders,” lamented Archbishop Suharyo, the president of the Bishops Conference of Indonesia, while speaking to the Vatican’s Fides news agency. With about 87 per cent of an estimated 270 million people professing Islam, Indonesia is home to the world’s largest Muslim population. Christians together ‎make up nearly 13 per cent. Despite Catholics forming a mere 3.5 per cent, the Church, with its vast network of educational institutions and social outreach programs, is greatly respected and appreciated. In the presidential race, President Joko Widodo is seeking a second term against his challenger Prabowo Subianto. The two men also faced off in the 2014 election, when Mr Widodo won the popular vote by a margin of about 6 per cent, getting 71 million more votes than Mr Prabowo. Archbishop Suharyo said clean politics means “a clean race and an honest and transparent administration of power that benefits all citizens”. In this situation, he said, the Church should encourage Catholics, inspired by the values of upright politics, to participate in the government framework. Among the candidates running for election are 151 Catholics. Archbishop Suharyo called for a politics inspired by a sense of healthy nationalism that is inclusive, understood as national interest rather than a nationalistic ideology that tries to exploit religious fanaticism to gain power, adversely affecting religious minorities.